With the change in weather (Australia is heading into cooler weather now) I've started going more for cooler grey and purple toned shadows, so I decided to reorganise my Inglot eyeshadow palettes to suit my changing needs. 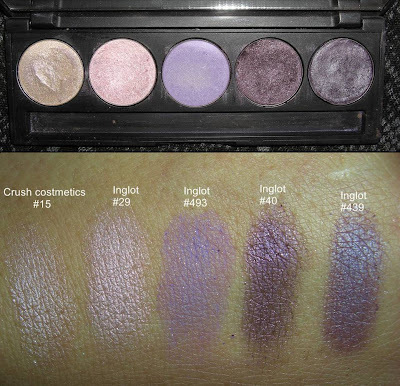 I already had 2 x eyeshadow palettes from Inglot that fit 5 shadows each, but I felt the colours in each were too similar. Plus I had bought a few other Inglot eyeshadow refills that didn't have a home. So last weekend I bought an empty Inglot 10 pan palette and started swapping my colours around. This is what I ended up with. The good thing about the Inglot round palettes is they fit my MAC shadows as well. Bonus... means I don't need a separate palette for my favourite MAC e/s. A few other brands' shadows also fit in there, so I use the same palette for all my favourites. All photos are with flash - when I was taking the pics it was a horrible overcast day and it was impossible to shoot without flash. All photos can be enlarged bi clicking on them. 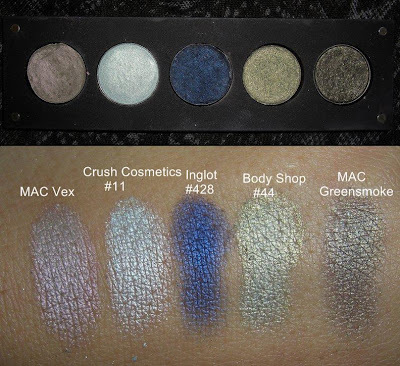 My favourite out of this palette is 420, just look at the incredible pigmentation. I still have my Naked Palette which is fabulous for warmer toned shadows, but during winter I know all three of my Inglot palettes will be getting a good workout. Do you change your shadows around based on the weather? These shadows look amazing! Nice organized well done! This post makes me realise I need more Inglot! @vintage - inglot is less than half the price of mac shadows here which is why i have so many. Plus their quality is amazing. @makeupattitude - thank u! I feel better now that everything is orrganised. 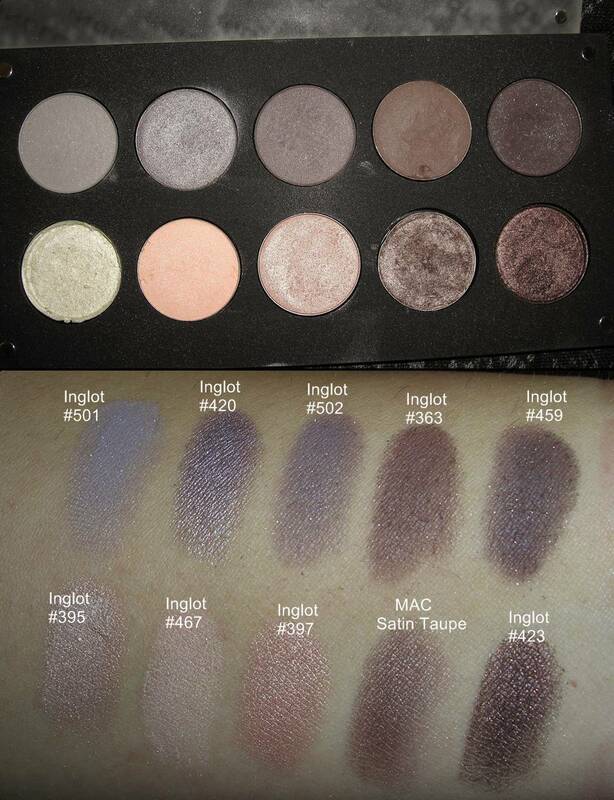 Your Inglot swatches are the best - they are just all so beautiful! Oh no! 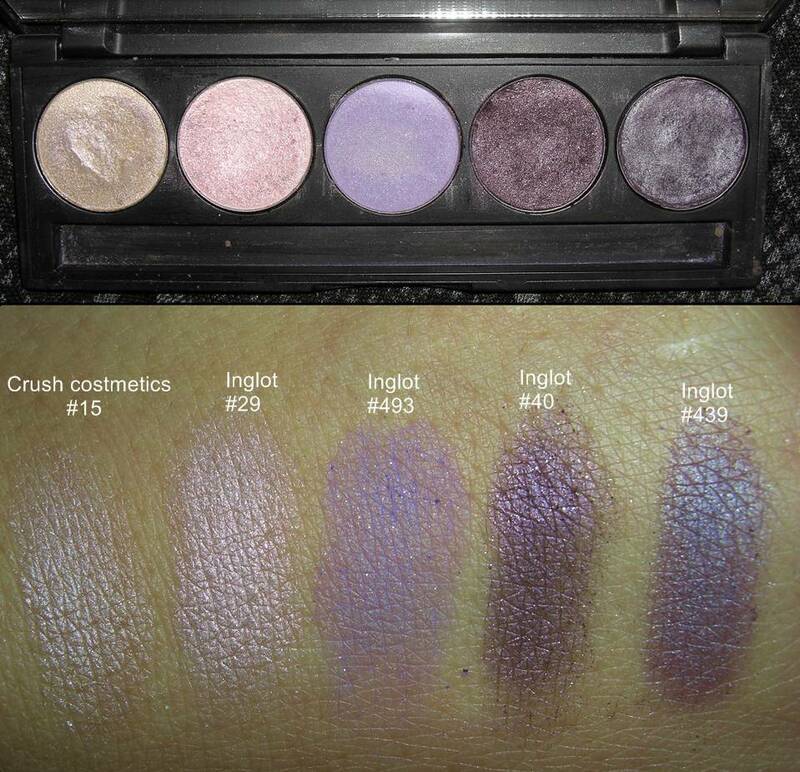 I just placed an immense INGLOT order, but now I want some of the lovely purple-y grays you swatched! @Lori - oh what a shame they don't ship there, although it's only recently they've started having online AU store, so maybe they're expanding? @Emily - ooh which size palette are you getting? It comes in a 20 now. @Fee - thanks, and considering they're so much cheaper than MAC I'm happy to go with them! @Jessica - oh no, well maybe next time. And can't wait to see what you've ordered. @Christina - you won't regret it, they're really good quality. Oh god, I'm going to need a few Inglot palettes aren't I... yours look stunning. Gosh- I am really missing something not having any Inglot shadows in my arsenal! Lovely, lovely colors! @Makeup Merriment - thank you Jeanie, they're really good quality as well and the choice of colours is amazing. @Ebru - Inglot is a dangerous thing, you become addicted so quickly! @FiaSo - Hmmm... I like them both, but if I was being honest I think the Inglot ones are better than MAC. With MAC some of the formulas are a bit hit and miss, but in my experience all my inglots have been great. Plus they're half the price of MAC here in AU. Once you swatch a few Inglots, you'll see how fantastic they are.